Shaanxi Primary and Middle Schools English Teaching conference and the 20th "Star Of Outlook" English talent conference Shaanxi branch's opening ceremony were successfully held at the Xi'an Foreign Languages School, which is affiliated with the Xi'an Foreign Languages University, on September 20, 2018. This conference was hosted by the Shaanxi provincial organizing committee for the "Star Of Outlook" English talent conference, which is organized by Zhong Shi Qi Le culture media Co. Ltd., and co-organized by Xi'an Foreign Languages School affiliated to Xi'an Foreign Languages University and the Meten international education group as the officially designated language guidance organization. They also had the support and recognition from the Shaanxi Provincial Primary and Secondary Schools, and the public welfare academic exchange activities were held for the first time to help the development of English teaching in Shaanxi Province. Zhao Yinqi, general producer and host of the "Star Of Outlook" English conference, and Professor Mei Deming, the director of the academic committee of China Foreign Language Strategy Research Center, were invited as special guests for the conference. In addition, Zhang Xuelian and Zhang Guangyou, English professors from the Shaanxi Academy of Educational Sciences and Lianhu teacher's training school in Shaanxi Province respectively, were the keynote speakers sharing their academic expertise with the on-site teachers. Furthermore, Yue Yang, the president of the Shaanxi University of Foreign Language Teaching Research Institute and Zhang Huaibin, the president of the Xi'an Foreign Languages School affiliated to Xi'an Foreign Languages University were also invited as guests of honor. 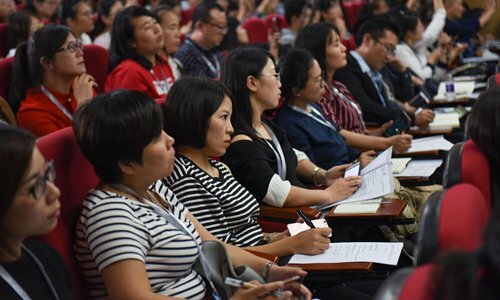 More than 400 English teachers from over 200 schools in Shaanxi Province attended the conference. The conference had the theme "Exploration on the development of students' thinking quality and English teaching under core literacy" under the correct guidelines of the education policy, to solve the critical problems encountered by English teachers in primary and middle schools. This conference had in-depth lectures and question & answer interactions with experts to re-evaluate and discuss the difficulties encountered in teaching, and promote the exchange and sharing of ideas. During the meeting, Professor Mei Deming gave a macroscopic explanation on the theme, with his rich teaching experience and strong thesis, and gave a great learning experience to the on-site teachers. The report aroused strong recognition of the present guests and teachers, which made them realize that the development of a student's core literacy is the reflection of the national state, which is a guiding significance for Shaanxi English teachers' teaching under the new curriculum standard. Zhang Xuelian gave substantive guidance to teachers on the spot by sharing personal reflections on actual cases in teaching, and gave detailed solutions on how to implement the cultivation of thinking quality under the core literacy in teaching. Zhang Guangyou shared the learning experience of the new curriculum standard with the on-site teachers, which further clarifies the adjustment and changes in education, teaching methods and strategies under the guidance of the new curriculum standard. Participating teachers at the conference expressed that it has given them new ideas for teaching, and has led to new understanding of the cultivation of students' core literacy. At the same time, the expert lecturers answered questions for the on-site teachers individually, taught the improved educational concepts of the English subject and shared their teaching experience, inspiring the attending teachers. In the late afternoon, the 20th "Star Of Outlook" English talent conference Shaanxi branch opening ceremony officially started with Zhao Yinqi's opening ceremony speech. He said the "Star Of Outlook" provides the platform for the children to present themselves and allow more children to understand the world and for teenagers to have a chance to communicate with the world. Chen Yuyao, one of the top 10 contestants from the 19th "Star Of Outlook" English talent conference came to surprise Zhao Yinqi, and introduced the attractions and delicacies in Shaanxi in fluent English. 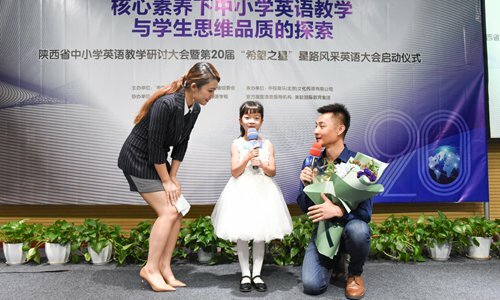 The teachers praised her performance, and expressed full support and recognition in having such a platform that can simultaneously display English ability and improve psychological and mental ability to showcase their own capability. In 2018, more than 100,000 people signed up for the Shaanxi branch "Star Of Outlook", including more than 100 schools with nearly 450 teachers awarded the certificate of excellent guidance. At the same time, the opening ceremony also presented the excellent organization award of Shaanxi branch to the schools with outstanding performance. The Shaanxi provincial organizing committee specially invited Zhao Yinqi to present the distinguished contribution award to the schools of the 21 contestants who were qualified for the national ceremony. At the end, Zhao Yinqi, Professor Mei Deming, Yue Yang, Pan Yanqiong, Shaanxi provincial organizing committee of "Star Of Outlook" English talent conference executive director; Zhang Xuelian and Zhang Guangyou, together launched the 20th "Star Of Outlook" English talent conference, bringing the conference to a climax and leading the conference of English teaching in primary and middle schools in Shaanxi Province and "Star Of Outlook" English talent conference Shaanxi branch district opening ceremony to a successful end.